Most of us use every day, “over the counter” yarns for our projects. I personally love craft stores – the yarn section in particular. But every once in a while I have the urge to splurge. That’s when I go to a LYS (that isn’t so local). My favorite LYS is Patternworks in NH – which is about 3 hrs from here. I thought it would be fun to dream for a change. 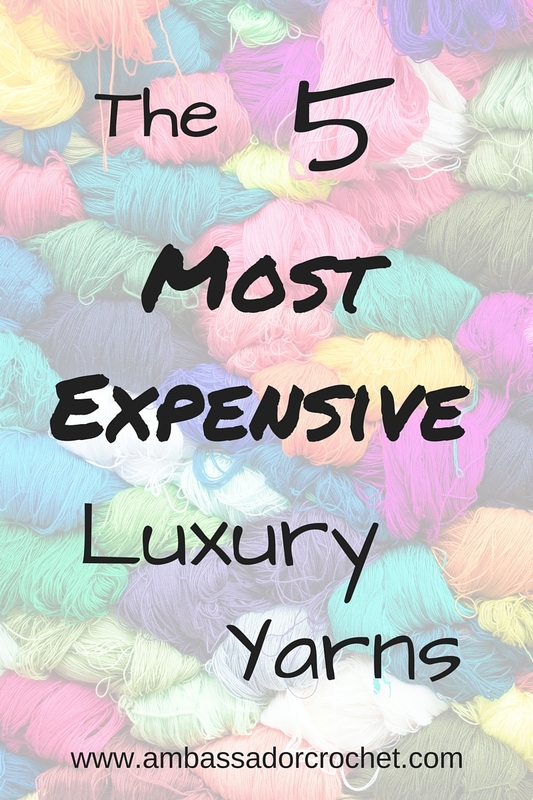 So I did some research to find out, if money were no object, what is the most expensive yarn money could buy? You might be surprised at the fiber content of some of these. I compared everything in yards (weight just varies too much) and then I converted all the yards as close to 200 yds as I could come so it was easy to see the price differences. Price: $299.75 for 218 yds. Note: From all my research, Vicuna is considered the world’s most expensive yarn. Price: $198 for 200 yds. Fiber content & Description: Muskox also called qiviut (kiv-ee-ute) in the Eskimo language, is considered one of the warmest and most luxurious fibers in the world. Price: $259.99 for 570 yds (or $104 for 228 yds). Fiber Content & Description: 100% cashmere – the ultimate in color, softness and luxury. Would you add any of these to your dream list? I love yarn, but I do not knit that well! I am new to crocheting, I chose Lion Brand Thick and Quick to make a afghan but the problem was the ends fray so much that it is hard to weave them in. Can you give me some tips on our to stop the fraying. Hi Heather! When I use yarn that frays easily I leave an extra long beginning and ending tail and I trim it right as I’m about to tie them in so it’s freshly cut. That seems to help. It’s only sold in an Estonian yarn shop Liann Lõngad which has 3 stores and an online store. However, this yarn is currently not available. Thanks for the info! I’ll check it out. I am an expert knitter and love using fine, luxurious yarns. I have purchased the Quiviut and loved it. Although the cost is so high I am seriously considering working with these other fine yarns for my own designs pieces. I have successfully sold pieces made with fine, but much less expensive yarns. It’s time to venture into these top yarns. I’ll have to save money to do this and start out with small pieces. That would be a great niche market for fine crochet work! I would love to see some of your pieces when you get that far. Hi, I think I would purchase the last one you mentioned if I could do it justice !! !